“Pool Envy” is a brand-new custom built, 5-bedroom, 6 bath luxury home designed with fun and relaxation in mind. 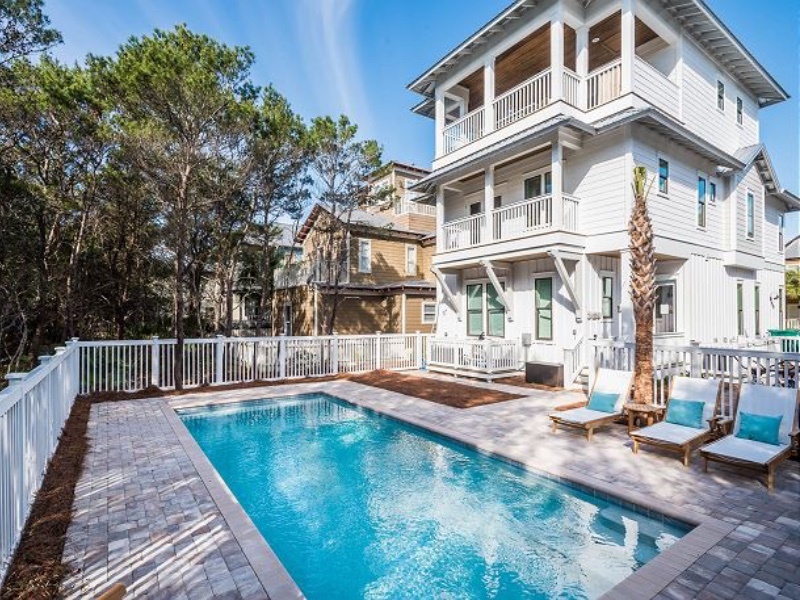 Conveniently located in popular Seacrest Beach, this dream home has easy access to many beach communities including Seaside, Alys Beach and Rosemary. In addition to having one of the largest, private, heated pools in Seacrest, you are only steps away from the award winning 12,000 square foot lagoon style multi-level pool with waterfalls and waterscapes! “Pool Envy” is situated at the front of the community just a few short minutes from the beach as well as countless dining options within walking or biking distance. The home features brand new High Def Smart TVs in every room as well as the third floor outdoor kitchen. This stunning home boasts inviting, coastal décor with no detail forgotten. Top-of-the-line finishes, stainless appliances and hardwood floors are just a few of the details that will create an upscale feel with all the conveniences of home. This spacious home that sleeps 12, includes two master suites with king beds, two guest rooms with queen beds and a bunk room that sleeps four, all with private bathrooms. This family friendly home has a third floor designed for entertainment. With a separate bonus room ready for games, you can step outside onto a fabulous deck that includes a fabulous outdoor kitchen. Enjoy the view of the private pool while grilling, relaxing or reading on the custom swing. During your stay in this luxury beach home, you will enjoy the comforts of endless amenities. Whether it is swimming in your own private pool, enjoying a ride on the complimentary bikes or simply relaxing in the breathtaking luxury of comfortable, professionally decorated space, “Pool Envy” is the perfect beach vacation.